After 8ish weeks of diligent cycling and four(!) 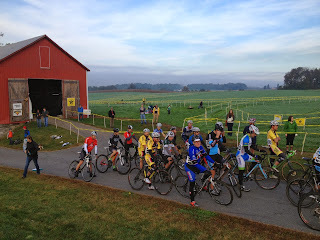 skills practices, there was no denying it on Saturday morning: it was time for my first cyclocross race. I arrived at the venue early and looked out at the beautiful course, trying to determine how technical the turns would be. "They don't look bad at all," I thought. "This might go OK."
I went to the registration booth, where the process was flawless. They were expecting me, given that I'd already given them money. I had to give them a bit more for my one day license, but that was expected, too. There was still a ton of time left but I decided to kit up and ride the course to get a feel for it. And that's when the panic set in. So seeking a break from running, I now find myself two days from my first cyclocross race. In the past eight weeks, I've been mostly loyal to riding. I've only run 4-5 times, including picking up 2nd place in my AG at a 5k race. I've been riding over most of my lunch hours, and have gone longish on most weekends. For the past 4 weeks, I've attended a cyclocross skills practice, along with 5-8 other riders, all of whom have more experience than I.